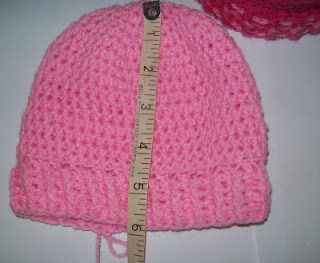 The beanie begins at the top of the head and worked down to the ribbed edging, the beanie is worked in one piece using the hdc st, which makes a nice closed stitch. Beginning ch 1 of every rnd is not counted as a st.
Chain 4, sl st to first ch to form a ring. 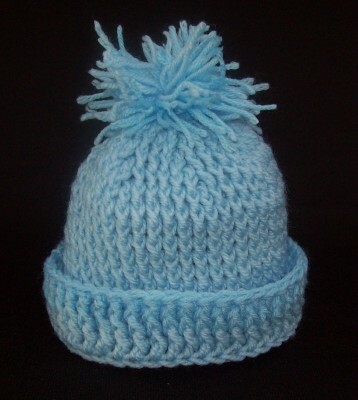 The beanie-babe is designed as a smart grow. It will grow with your baby by adjusting the ribbed edge. 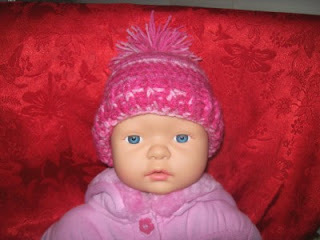 Good luck with your baby beanie, I’d love to hear your feed back. 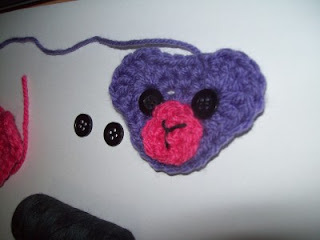 Please do not sell this pattern, please link back to me if you use this pattern, I’d love to see this used for charity, and you can make and sell items from this pattern too. 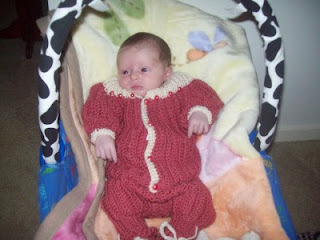 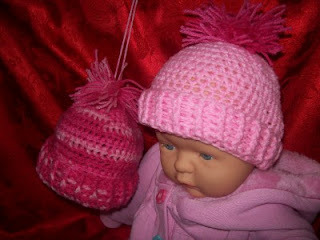 Labels: Beanie-Babe, Crochet for Baby, crochet hat., free pattern. crochet hat, free pattern. 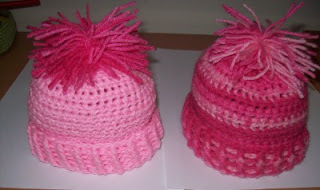 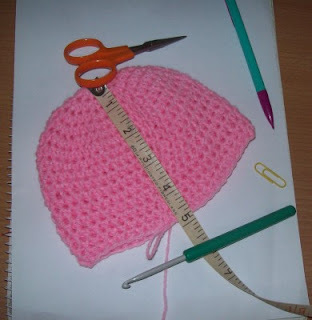 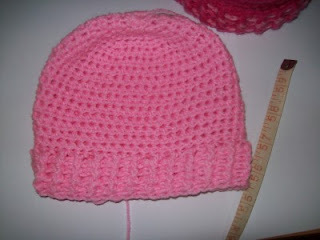 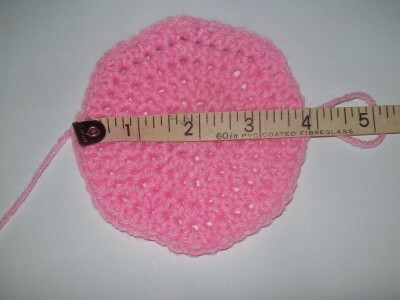 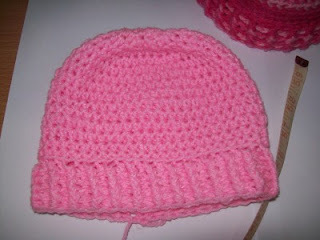 crochet hat., free tutorial, Small Gift Ideas. 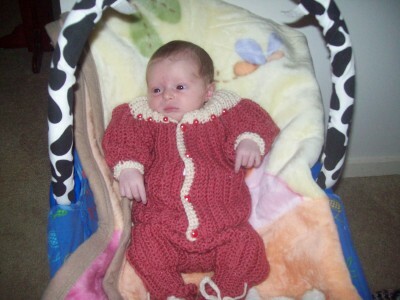 My dear sweet grand daughter is wearing the one piece diaper cover, matching one piece sweater and booties here, she is 2 weeks old and her name is Cindy. 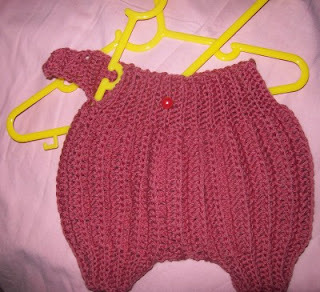 Introduction: The one piece diaper cover is worked side ways and in one piece beginning at right hand side (front) which includes the waist, the body of the pants and the leg hole, after 10 pattern repeats the leg cuff ends and the crutch part begins for 3 rows, then the left hand front and back begin for 21 pattern rows, then onto the rear crutch, which is made slightly larger than the front using a trbl st in one row of the 3 pattern rows, the pattern then continues on to the right hand rear side for 11 more pattern rows. The pattern is quite repetitive so you will get the hang of it in no time. 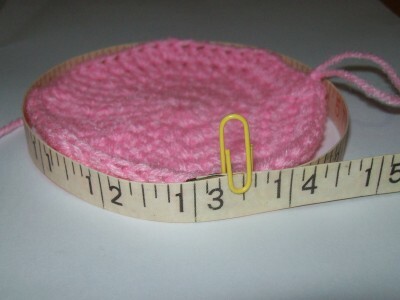 Measurements: leg opening stretched 6 inches around, waist 16 inches around, length 8 inches, width around the widest bottom part, 24 inches stretched. 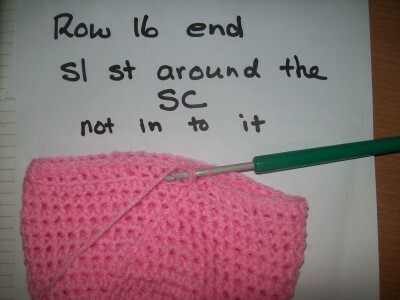 Remember to work in the back loop of every st unless it is a ch st. If you choose not to make the button up flap, break off yarn leaving a long tail for sewing, pick the side you want to show on the out side then fold that in wards, sew the pants up down the leg side, then sew up the crutch, add elastic if needed. 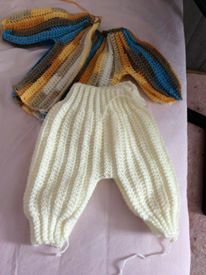 This is the one piece diaper in a longer length, the pattern was adjusted by Carina Norell, she made the diaper legs longer very clever! Please watch BobWilson123 video tutorial for how to make the diaper cover and while you are there click the like button to show your support for this amazing teacher! 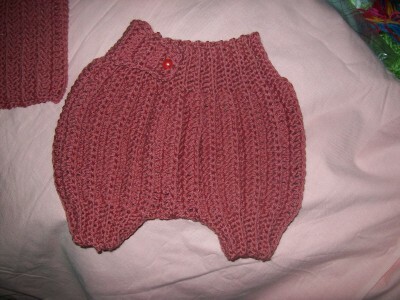 Good luck with your one piece diaper cover, I’d love to hear your feed back. 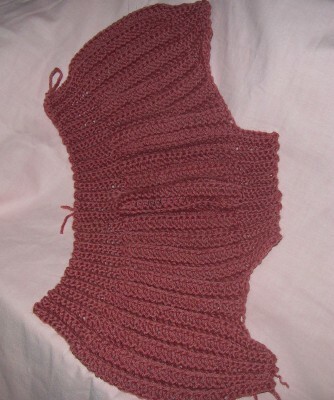 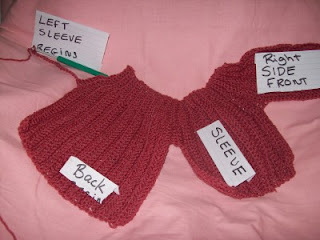 sleeve length, shoulder to cuff, 9 inches, body from collar to bottom edge 11 inches, approx. 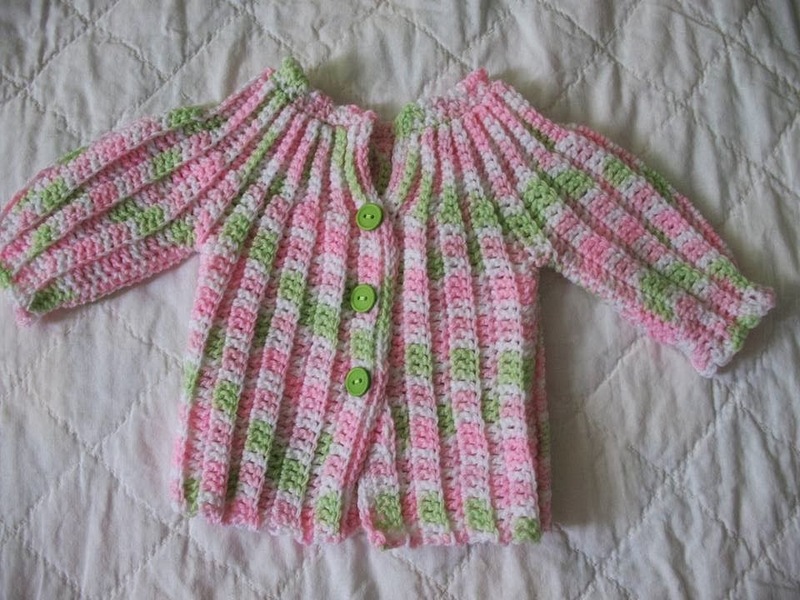 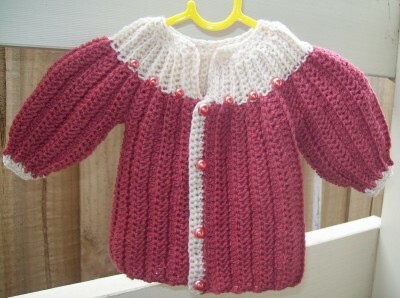 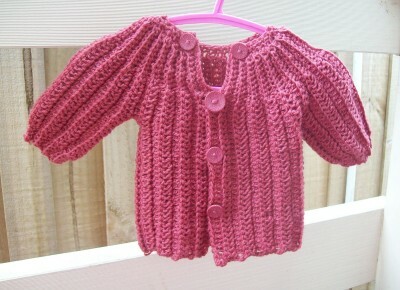 This one piece sweater was made by Mary hall, so pretty! 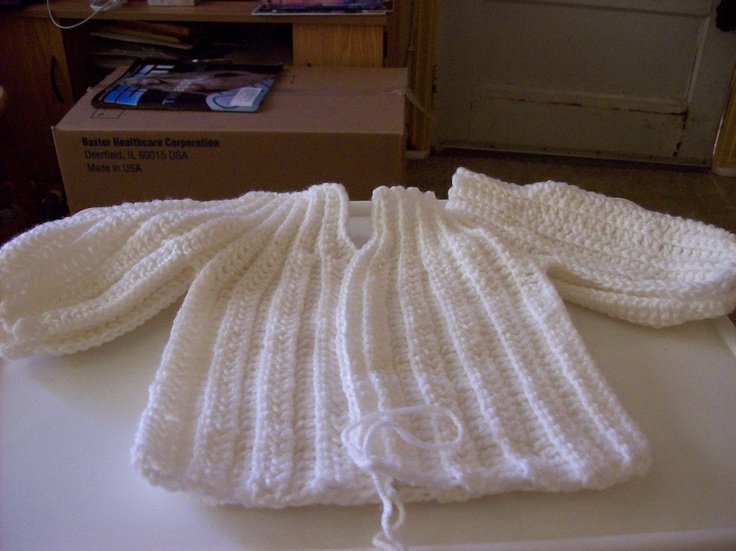 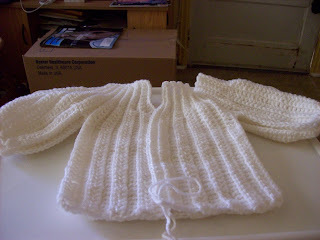 Introduction: This one piece sweater/cardigan is worked in one piece beginning at the right front side, then a sleeve, then the back, then another sleeve, then the left front which is made slightly wider than the right, this is for the over flap to button the sweater/cardigan. 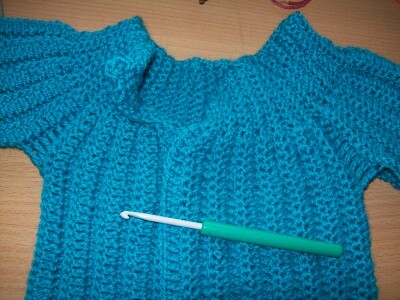 Then the sides and sleeves are joined, followed by a collar which brings it all in. 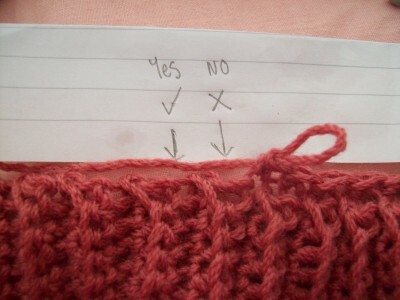 The sweater/cardigan is reversible if you refer to button up on the opposite side. 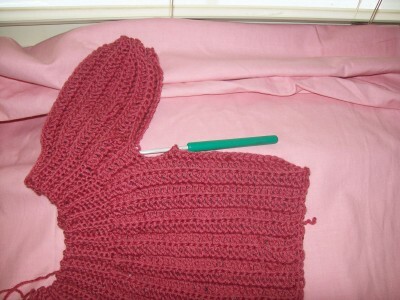 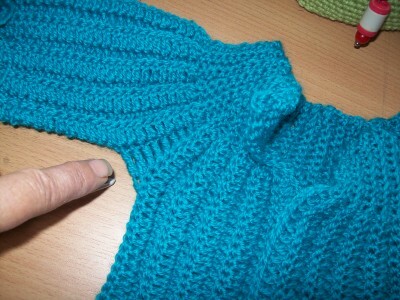 The sleeve cuffs are included in the making of the sleeve. 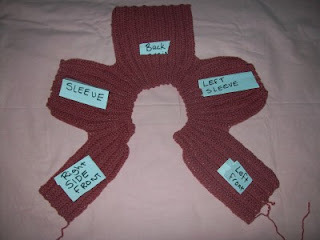 The pattern is quite repetitive so you will get the hang of it in no time, it may be easier to count the dc rows of each panel, right front has 10 panels, sleeves have 19 panels, back has 21 panels, left front has 15 panels. 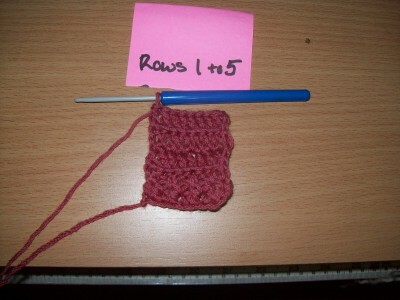 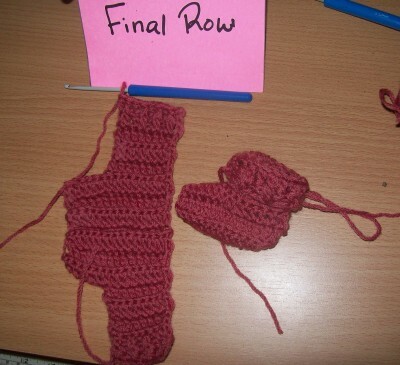 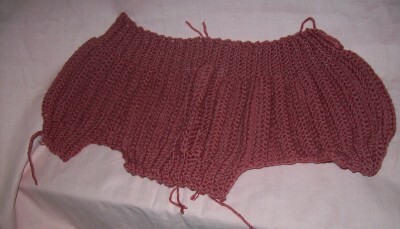 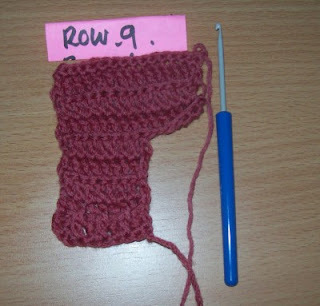 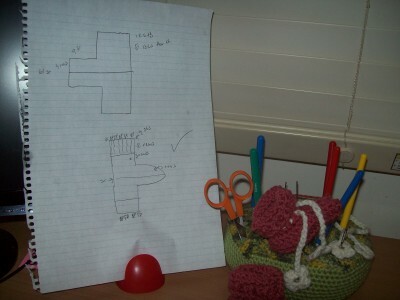 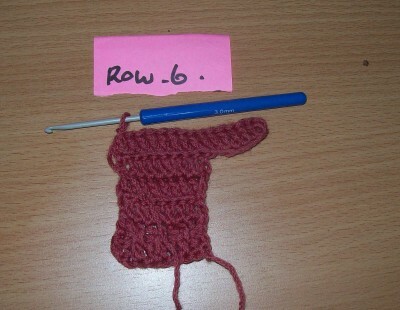 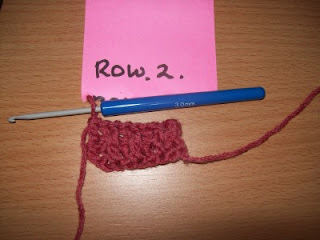 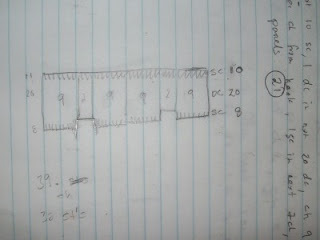 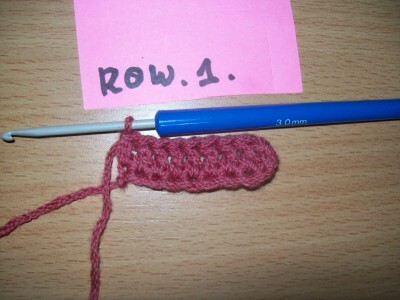 Row 6 to 11. repeat rows 4 and 5, do not ch 3, now you can break off the yarn. 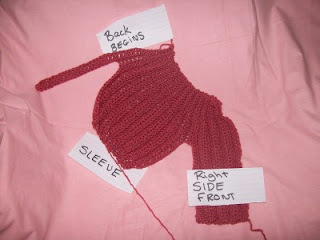 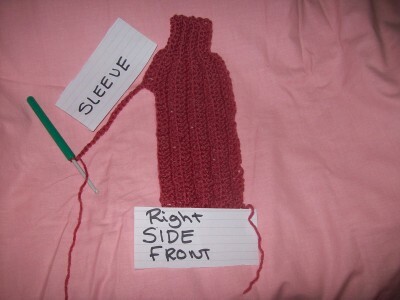 Turn your sweater/cardigan inside out, line up the back and side from the bottom, you can sc them together or a simple whip st, I did mine the sc way, make sure each st is matched up and secure them together all the way up to the cuff, repeat for the other side. The collar: By this stage you will notice that the collar is too wide, so we have to pick up and crochet st’s around the collar. I had curling of my collar and was concerned it would not come out. 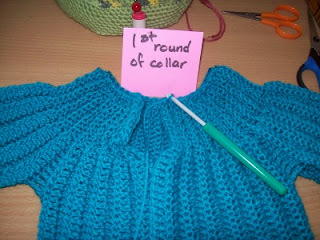 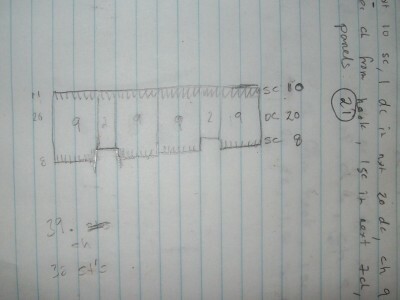 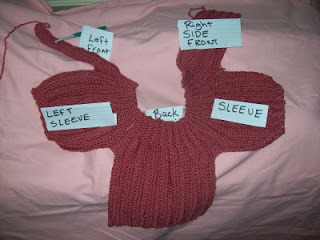 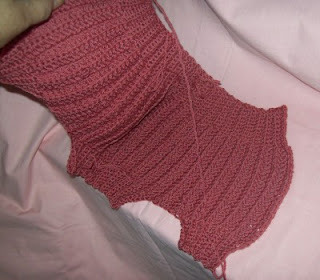 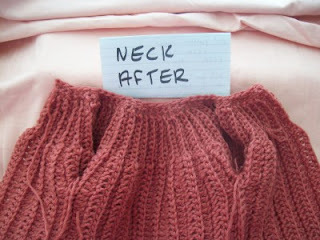 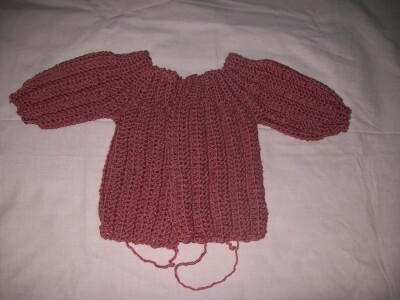 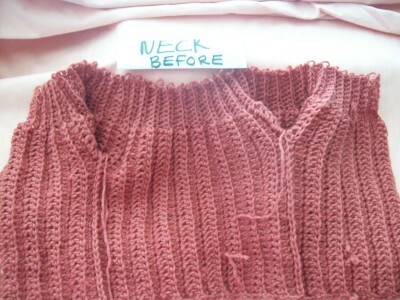 You may like to make the collar a row or 2 longer, you can do this with out decreasing. 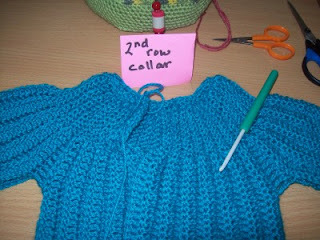 Now if you haven’t already, get out that needle and sew in loose ends, add buttons to right front, as many that suits you. 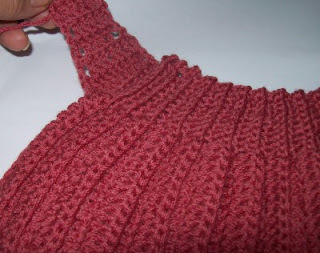 Now you can be a little fancy and add some nice picot edging around the sleeves or collar, add a flower or even make it in a two tone color. 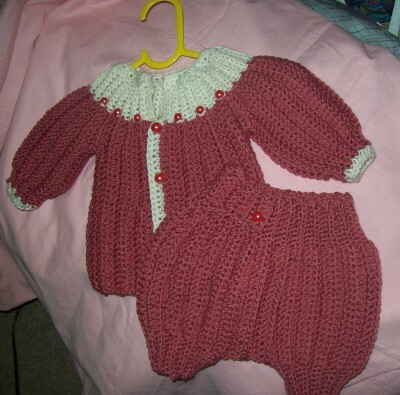 Please visit this page for a larger size, 18 month old. 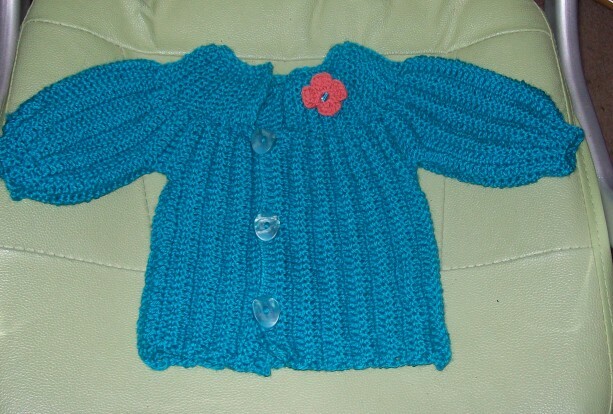 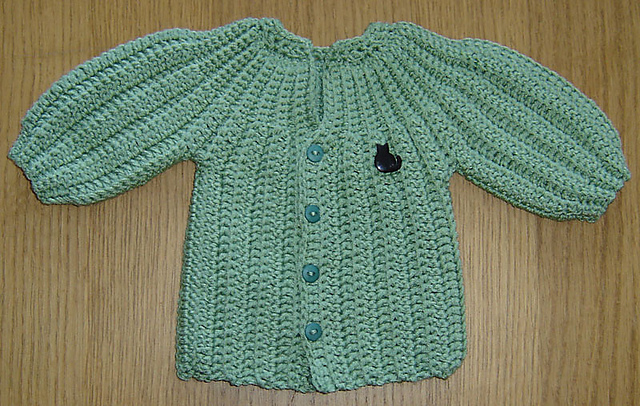 It’s taken me a wee while to complete this version of Cat’s One Piece Wonder baby cardigan in a larger size for my 18 month old daughter. 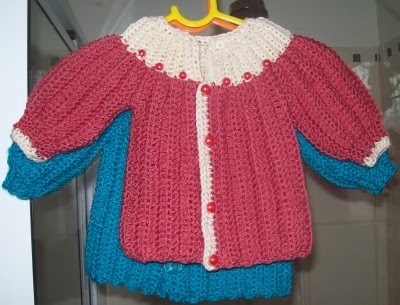 Good luck with your one piece sweater/cardigan, I’d love to hear your feed back. 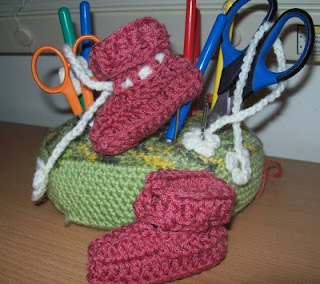 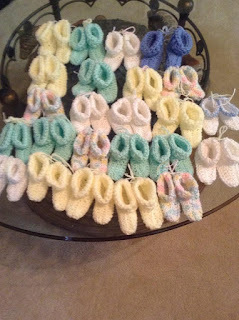 Suzanne Ivie Willis made all of these for charity, I'm so chuffed to see the picture, thank you so much for sharing. 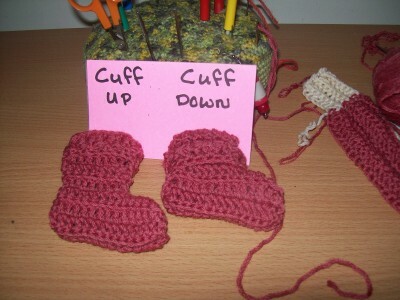 Bootie is worked in one piece, beginning at the top of the cuff, down 1 side of the leg, heel and foot part, then the other side of the leg part and up to the other top of the cuff. 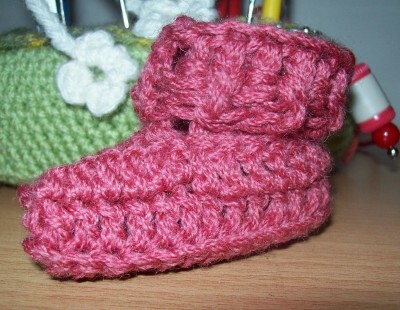 The cuff has a simple ribbed look by using the bpdc and fpdc st.
To sew up one piece bootie, it is best not to crochet the bootie closed, a simple whip st makes a finer finish for the inside of the bootie, gentle on the baby's feet. 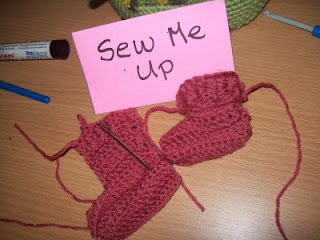 Sew one piece bootie up all in one go, pick the side you like the best to show on the out side, then make the fold so that is on the in side of the bootie. 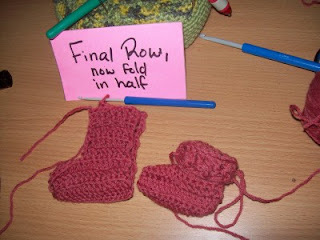 Sew down the side of the leg, across the top of the foot around the toe part, run the yarn neatly through the middle of the sole (row 9 in pattern), then continue to sew up the other leg side, secure yarn and finish off. Turn the one piece bootie right side out, turn the little cuff over and there you have it. You can finish off with some ribbon or a length of chain threaded through through the row above the foot piece or any where of your liking. I thought you may like some insight in how I planned this one piece bootie, firstly I did a simple sketch of what I had in mind, I did make a bootie off the top sketch but is was like one of those Christmas stockings you make, so I had to refine it with a bit of shape and I made the bootie off the second sketch after I refined that a little more too. 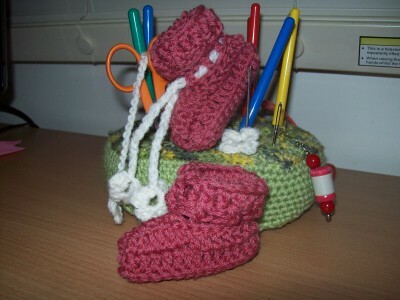 Good luck with your bootie, I’d love to hear your feed back. 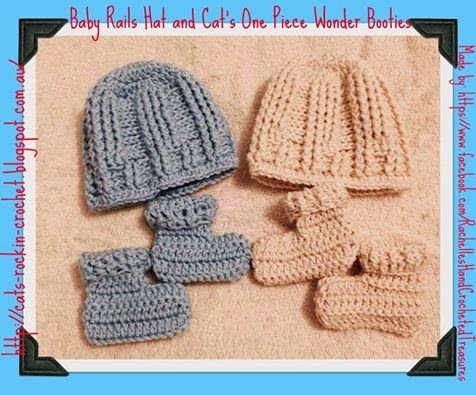 Check out the video tutorial for these by Bobwilson123, be sure to give her the thumbs up, better still subscribe to her you tube video tutorials, new tutorials up loaded weekly. 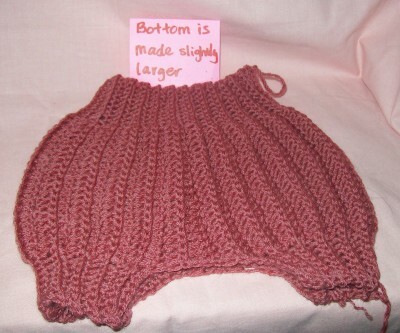 Please do not sell this pattern, please link back to me if you use this one piece bootie pattern, I’d love to see this used for charity, and you can make and sell items from this pattern too.